We can help you achieve the marketing goals of your promotional events through our across-the-board collection of Custom Youth Apparel clothing line! 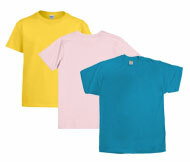 Our custom youth T-shirts, long sleeves, sweats, athletics, and custom women's clothing contain the popular eye-catching extensive Gildan, Hanes, Anvil, Fruit of the Loom, Jerzees, Champion, Russell, Tie-Dye, Bella, Champion, A4 Youth, and American Apparel collections. Whether you need giveaway youth sports shirts or custom polo shirts with logo, we can convert the art form into your visualized masterpieces! With our high quality screen digital printing, our apparels will raise everyone’s spirits for fund raising, sports, school, alumni, and corporate events. 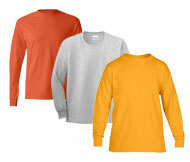 Personalize your custom long sleeve shirts with intended colors, and styles for creating the final designs before we imprint them. 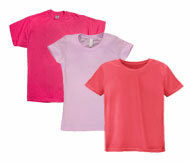 Lead us with your imagination and creativity, so that we can manufacture the apparels according to your style and needs. Set up the spirit at formal and informal events with our collection of custom organization and team gears for the volunteers, visitors, students, and customers. 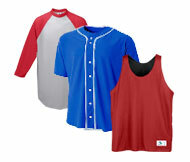 Get your spirited event look covered with our collections of Custom Youth Apparel that are suitable for sports, school, graduation, reunion, tradeshows, and music events. Our all-embracing custom youth t-shirts include the Gildan, Hanes, Anvil, Fruit of the Loom, Jerzees, Champion, American Apparel, Tie-Dye Juniors, Bella, Russell, New Balance and Dyenomite collections! 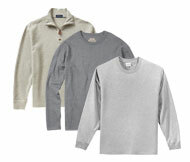 Look through our collection of custom long sleeve shirts which are soft, comfortable, smooth, and light with a vintage feel. Our classic-cut youth sports shirts are digitally screen printed to exhibit organization logo and texts when volunteers, visitors, students, and patrons wear them. Consider our youth custom women's clothing for your team, corporate, fund raising, school, tradeshow, fair, or conference attire. Get our custom polo shirts with logo for spreading your message during charity events, community initiatives, and marketing events. Our Custom Youth Apparel is targeted specifically for youth people so that they feel motivated to change things for the better! Get your emblems be noticed by thousands of people by ordering from us.